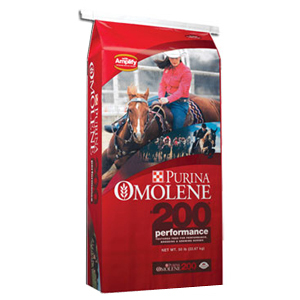 Pasturas Los Alazanes is proud to offer Omolene #200® Performance horse feed. Omolene 200 is formulated for competitive and performance horses, mares in foal, lactating mares and yearlings. Purina Omolene #200® Performance Horse Feed is an excellent source of nutrition for stallions, broodmares,and yearlings that need the additional fortification to meet the demands of breeding and growing. Whether you’re showing, conditioning or just working hard, this sweet feed will help your horse perform at his best. Stop by the store today to pick up this Purina product. If you have any questions about this Purina product or any of the other products we have available, please give us a call or stop by the store. This entry was posted on Monday, May 4th, 2015 at 9:14 pm	and is filed under Horses, News & Updates. You can follow any responses to this entry through the RSS 2.0 feed. You can leave a response, or trackback from your own site.